Building on nearly eighty years of scientific work, The Handbook of Emotional Intelligence is the first definitive resource that brings together a stellar panel of academics, researchers, and practitioners, in the field. Sweeping in scope, the text presents information on the most important conceptual models, reviews and evaluates the most valid and reliable methods for assessing emotional intelligence, and offers specific guidelines for applying the principles of Emotional Intelligence in a variety of settings. REUVEN BAR-ON, an American-born Israeli psychologist, is the founding director of the Institute of Applied Intelligence in Denmark. He is also a member of the Collaborative to Advance Social and Emotional Learning at the University of Illinois and a member of the Consortium for Research on Emotional Intelligence in Organizations at Rutgers University in the US. Dr. Bar-On has been involved in defining, measuring and applying "emotional and social intelligence" since 1980.He coined the term "EQ" and developed the "EQ-i", the first test ofemotional intelligence to be published. JAMES D. A. PARKER is an Associate Professor in the Psychology Department at Trent University in Ontario, Canada, where he directsresearch on alexithymia and its relation to emotional intelligence. 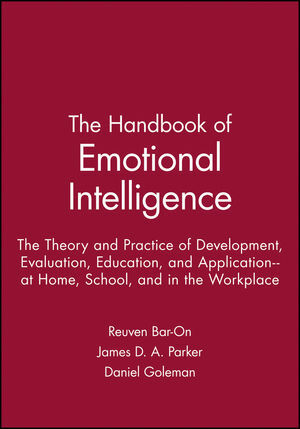 Dr. Parker joined Dr. Bar-On in researching emotional intelligence in 1996 and has co-developed with him the "EQ-i:YV", the first published test ofemotional intelligence for children and adolescents. Part 1 Conceptualization of Key Constructs. 1 Social Intelligence: The Development and Maintenance of Purposive Behavior. 2 Social Competence: The Social Construction of the Concept. 3 An Overview of the Alexithymia Construct. 4 Emotional Competence: A Developmental Perspective. 5 Emotional Intelligence as Zeitgeist, as Personality, and as a Mental Ability. 6 Psychological Mindedness and Emotional Intelligence. 7 Too Many Intelligences? Integrating Social, Emotional, and Practical Intelligence. Part 2 Normal and Abnormal Development of Emotional Intelligence. 8 Levels of Emotional Awareness: Neurological, Psychological, and Social Perspectives. 9 Poor Judgment in Spite of High Intellect: Neurological Evidence for Emotional Intelligence. 10 Practical Intelligence and Its Development. 11 Development of Emotional Expression, Understanding, and Regulation in Infants and Young Children. 12 Emotional Intelligence from the Perspective of the Five-Factor Model of Personality. 13 Intelligence, Emotion, and Creativity: From Trichotomy to Trinity. Part 3 Assessment Methods and Issues. 14 Assessment of Alexithymia: Self-Report and Observer-Rated Measures. 15 Selecting a Measure of Emotional Intelligence: The Case for Ability Scales. 16 Clustering Competence in Emotional Intelligence: Insights from the Emotional Competence Inventory. 17 Emotional and Social Intelligence: Insights from the Emotional Quotient Inventory. Part 4 Prevention Strategies and Interventions. 18 Criteria for Evaluating the Quality of School-Based Social and Emotional Learning Programs. 19 The Effectiveness of School-Based Programs for the Promotion of Social Competence. 20 Social and Emotional Competence in the Workplace. 21 Emotional Intelligence, Adaptation to Stressful Encounters, and Health Outcomes. 22 Emotional Intelligence: Clinical and Therapeutic Implications.